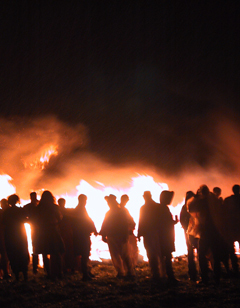 Nevill Juvenile Bonfire Society encourages all members to participate in activities in the build up to Our Night. We recognise that the skills, techniques and traditions need to be passed down from one generation to the next, and that can only be done by building up those skills amongst all members. We particularly encourage younger members to participate in torch-making, helping to build and paint the effigy and tableau as well as the set pieces. Parents have often commented on how bonfire has not only provided children with an understanding of this rich Sussex tradition but also developed their child's leadership and team-work skills. Those that have come through the ranks of Nevill Juvenile Bonfire Society have gone on to key roles within the Society as well as other Sussex Societies as adults, but all consider NJBS to be their home. So why not find out what it's all about and come join us in ensuring Bonfire has a very bright future. Want to know more? Then contact us at news@njbs.co.uk.